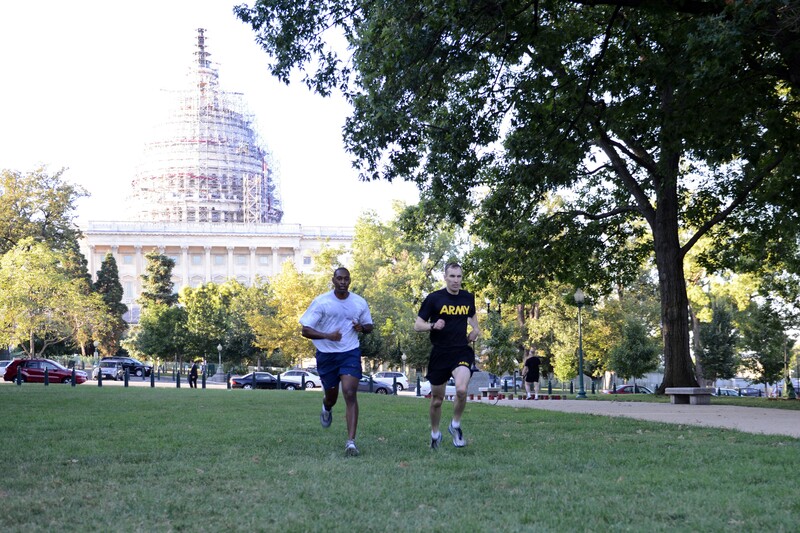 WASHINGTON (Sept. 11, 2015) -- Some congressional staffers, and even some military officers serving in legislative liaison positions here, might have never worked so hard as they did during a 9/11-themed "workout of the day" in the Upper Senate Park on Capitol Hill. "What we got going on right here today is a commemoration for 9/11," said Maj. Adisa King, who works in the Army's Senate Liaison Division. "It's a workout of the day, and it's a chance to commemorate 9/11 by looking at all the numbers." 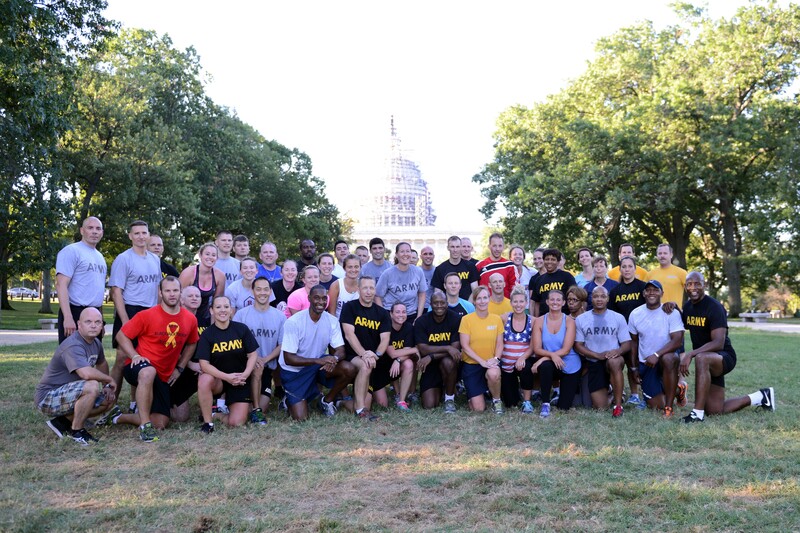 More than 50 service members and senate office staffers participated in a 9/11 commemorative workout on Capitol Hill, Sept. 11, 2015. During the workout, which lasted more than an hour, the repetitions for each of the exercises correlated with a number associated with the 9/11 terrorist attacks. "We are going to do something here that makes you remember those numbers," he said. When 9/11 happened, King was a first lieutenant and was in the "mountain phase" of Army Ranger School. "That's when they told us we got attacked," King said. "When they told us that, it changed everything for every Ranger School student. We were in the mountains then, and we knew where we had to go - we had to go to the mountains [in Afghanistan]. Everybody's senses turned on. It was a moment of silence as you are marching and moving out. We knew we were going to war." At about 8 a.m,, music started pumping from loud speakers, and participants broke into eight teams, each to perform a different exercise. Soldiers bear-crawled next to Sailors; Marines lunged alongside airmen and Hill staffers. Teams rotated between each of seven stations so they could perform all of the exercises. In between, everyone did burpees. And at the end of the hour-long workout, all the participants gathered in a group to do even more burpees, so that they could together accomplish a total of 2,977 repetitions - representing the lives lost on 9/11. Emma Kenyon, who works as a staff on the Senate Special Committee on Aging, said it was one of the toughest workouts of her life. "But everybody was real supportive, they gave a lot of encouragement, and I really appreciated it," she said. "This was a great way to pay homage to, or to honor the people in some way whose lives had been lost and those people who helped survivors or are survivors." Kenyon was in 5th grade at the time of 9/11 and said at the time she and her classmates weren't yet old enough to understand the meaning of what had happened. "Later, it became clear what had happened," she said. "But at that age, it didn't sink in what terrorism was, what it all meant. It was just the initial impact that something scary had happened." Army Maj. Donna Buono, who also works in the Army's Senate Liaison Division, helped plan the workout. She said she hopes the event will become a yearly thing. She was but a sophomore in college in Missouri when she first heard about the events of 9/11. "I was on my way to French class with my best friend," she said. "We heard about it on the radio on our way to class. We still had class, and we really didn't know what was going on until we got back out." She said it wasn't until she got home and turned on the news that she and her roommates learned the full scope of what had happened. While Buono was a Reserve Officer Training Corps cadet at the time, she said it didn't occur to her and her fellow cadets just exactly what the results of 9/11 would mean to them as future military officers. "But it has defined my life," she said. "Our lives." Navy Capt. Sarah Joyner, director of the Navy's Senate Liaison Office, was invited by the Army to participate in the workout. "I came out because on 9/11 I had friends in the Pentagon, friends on the ground," she said. "I lost friends and fellow shipmates in what happened in the Pentagon, and I wanted to make sure I remembered them and their families and what all the firefighters and policemen and all those people that serve our country do in their various ways." Joyner now works on Capitol Hill to help make sure the Navy gets all the information it needs from lawmakers - and the other way around as well. But she is also an F-18 pilot. When 9/11 happened, she was stationed at Naval Air Station Lemoore, California. "I was on my way to man-up a jet when I heard that the first tower had gone down," she said. "Somebody came out and said somebody just hit the tower - an airliner hit the tower. We went back in and checked out what was happening. By the time we got in, the second tower was being hit and we knew things had changed - our world had changed. " Joyner now has done five deployments. Included among those was one immediately after 9/11, where she was able to join with a multi-national/multi-service group to respond in Afghanistan. She said that the Army-planned workout was tough, and that the joint-service participation, and involvement by Capitol Hill staffers, really made it clear that defending the nation is a team effort. "This is a good workout," she said. "The Army did a nice job. They showed us what they needed us to do, and I think it was great teamwork. I think it was an awesome thing to see the staffers from various offices come out and join us. ... Defending our nation is not just service members, it's not just policemen and firemen. It's all the people, the civil servants and other people that make it work." Service members from the Army, Navy, Air Force and Marine Corps participated in the workout. Additionally, staffers from the offices of U.S. Sen. Mark Warner of Virginia, U.S. Sen. Mitch McConnell of Kentucky, U.S. Sen. James Inhofe of Oklahoma, U.S. Sen. Claire McCaskill of Missouri, U.S. Sen. Mike Crapo of Idaho and U.S. Sen. James Risch of Idaho participated.